I was excited when TLC Tours asked if I'd like to participate in Kelle Hampton's Blog Tour. I've read her blog, Enjoying the Small Things, you see. 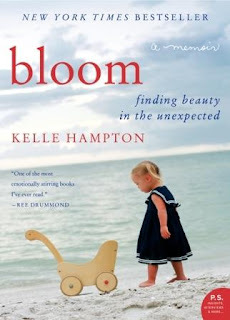 And so I accepted and received (free of charge, for review purposes) a copy of Bloom: Finding Beauty in the Unexpected. "From the outside looking in, Kelle Hampton had the perfect life: a beautiful two-year-old daughter, a loving husband, and a thriving photography career. When she learned she was pregnant with their second child, they were ecstatic. But when their new daughter was placed in her arms in the delivery room, Kelle knew instantly that something was wrong. Nella looked different than her sister, Lainey, had at birth. As her friends and family celebrated, a terrified Kelle was certain that Nella had Down syndrome—a fear her pediatrician soon confirmed. Yet gradually Kelle embraced the realization that she had been chosen to experience an extraordinary and special gift." I have said, many times, that I was very lucky to have received Spencer's diagnosis of Down syndrome during pregnancy. I was given the opportunity to grieve, accept and prepare - all before actually meeting our son. I've shared birth stories with my friends of children with DS, but I don't think I ever realized just how awful it could be, the shock of it. Before I even got through the prologue, I was crying with Kelle. I'd already read Nella's birth story on her blog before, but she shared that grief with her readers in the book... you can't help but travel her journey with her! I admire Kelle's willingness to bare it ALL for you, something I try to do in my own writing. I have a lot of respect for Kelle for her bare-it-all attitude in her writing. In this memoir, she shares her absolutely most ugly moments. She shares her awkward moments, too. And she share her healing. If you're not the mother of a child with DS, reading this book is as close as you can get to going through the experience, without actually going through it. And if you have gone through it, you may find it validates a lot of your own feelings along your journey. That may be the biggest service of this book, relieving the Momma Guilt so many women are carrying. All that said, Kelle admits she is overly emotional. It absolutely shows. This is one woman who is seriously over the top with emotions. It makes her seem a bit more like a character, though every bit was believable as non-fiction. I can relate to Kelle in a few ways, though. We're both bloggers. 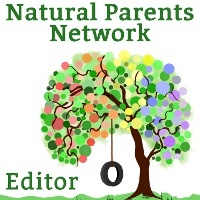 We're both mothers of multiple children, including babies with DS. I can relate to her desire for ceremony. And what's not to love about people that are very "high on life?" She appreciates the benefit of the hard times and hard emotions. She sees how the push us to grow, to bloom. I enjoyed crying along with Kelle in many of the chapters, even full-on silently sobbing while my own son with Down syndrome slept nearby. But I also found myself a bit jealous of Kelle's tribe. I certainly have friends that love me, but I've never felt as supported as she presents herself to be in this book. I don't think I currently have a "drop everything" friend... ok, maybe one (and I love you, sis!). I got lots of offers of support when we got the news. They were all encouraging words and several offers to connect me with someone who knew someone who had Down syndrome. I don't have friends that drop everything to fly across the country to be at my side for days, possibly weeks at a time. Also, Kelle is a great photographer. This book is chock full of beautiful photos of her family. Her children are adorable. As you read about major events along her journey, you get to see those actual events! And if you enjoy the book club thing, this book includes a questions for discussion section. From reading reviews on Amazon, it seems people had some other expectation from this book. It is a memoir. It is Kelle's memoir of her first year as the mother to a child with Down syndrome. This book is not about Nella. This book is not a reference source for new parents. If you enjoy reading memoirs, though, and living emotions vicariously, then you will love this book! Writer and photographer Kelle Hampton chronicles the simple joys of motherhood and daily life on her popular blog, Enjoying the Small Things. An advocate for individuals with Down syndrome, she has been honored by both the National Down Syndrome Society (NDSS) and the National Down Syndrome Congress (NDSC), receiving the NDSC National Media Award in 2010. 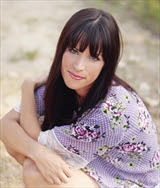 Kelle lives in Naples, Florida, with her husband, Brett; their three children, Lainey, Nella, and Dashel; and her stepsons, Austyn and Brandyn. Wow, it sounds like this book really hit home for you. Even more, it sounds like it would be a great look into motherhood with a DS baby for those of us who haven't had that experience.